Step 1 Add 12 patty pans to a muffin tray. Step 2 Sift spelt flour into a large bowl then add the rest of the dry ingredients. Step 3 Warm the coconut butter on very low heat in a pan on the stove then add to the dry mixture along with the milk, vanilla and coconut essence. Step 4 Divide the mixture up evenly into the 12 patty pans in the muffin tray and bake for 20 minutes or until a fork comes out clean. Step 5 Let stand until they are room temperature. Step 6 For the icing, place the ricotta in a medium sized bowl and add in the organic baobab & raw honey. Stir well to combine. Step 7 Grate 1 tablespoon of orange rind on a medium thickness into the bowl (if grated too thinly the zest adds too much moisture). Step 8 Once you have enough orange rind, juice half the orange and stir it into the mixture. Step 9 Ice the muffins and sprinkle the remaining orange zest on all the muffins. 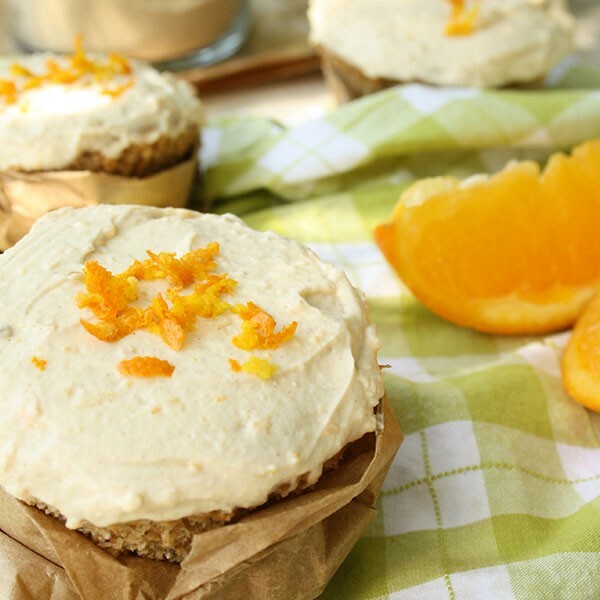 These deliciously moist muffins are light and feature Organic Baobab powder which gives a zesty freshness. A great healthy and guilt free snack!